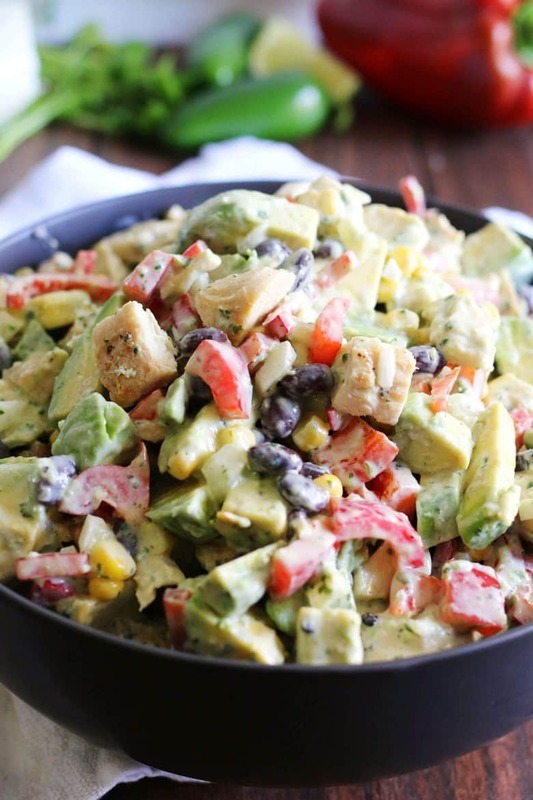 This grilled chicken avocado salad is topped with homemade jalapeno cilantro dressing. It is the perfect easy summer salad and great for quick lunches! I’ve been taking a chance on foods I don’t normally eat. Avocados used to make me squeamish, to say the least. At events, I could be seen scraping the avocado off of passed-appetizers to the amazement of my fellow guests. I have been hearing so many good things about avocados and their health benefits. Doctors have been telling me to add them to my diet for years – an avocado a day keeps the doctor away. Slowly, oh so slowly, I’ve been adding avocados to my sandwiches and tacos. I even added some to my huevos rancheros. It’s about time I gave in to my fear and added them to a salad. A grilled chicken avocado salad, in fact. In the summer, I find myself craving, and eating, a lot more salads. It made the most sense to start here on my mission to eat more avocado. This grilled chicken avocado salad is easy to make, delicious and dressed with a homemade jalapeño cilantro salad dressing. Start with grilled chicken. If you don’t have a grill outside, you can use an electric indoor grill or a grill pan to grill it inside. I season with a little salt and pepper but that’s it. 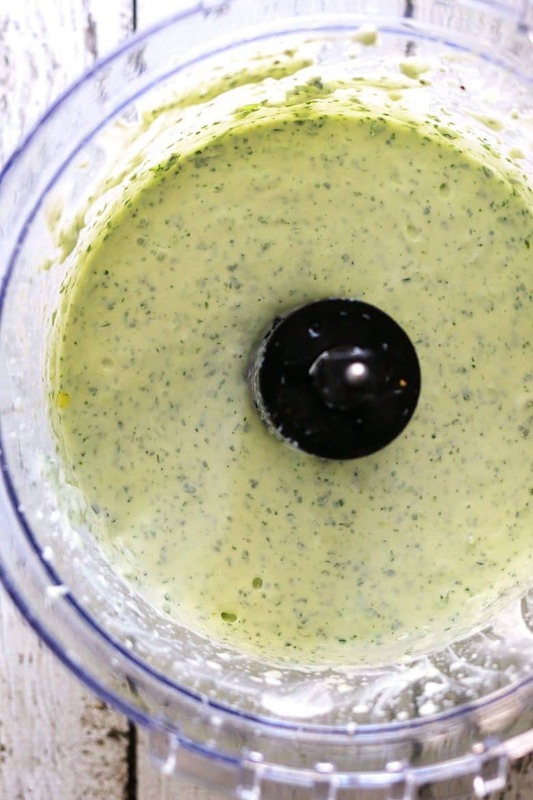 Then make the jalapeno cilantro dressing. All of the ingredients go into a food processor to be pureed. What you are left with is a thick and creamy dressing that is delicious with everything. I based it off of this easy sauce recipe. I’m not joking; this salad dressing is my new go-to for dipping veggies, all of my salads and next will be dolloped on top of a steak. Chop or dice the grilled chicken and all of the veggies and combine them in a bowl. Pour a cup of the dressing on top and mix everything together well. And that’s it – the end product is a delicious, and easy to make, grilled chicken avocado salad. It’s also my new favorite summer salad and we keep eating it. My doctor would be so happy about all of the avocados I’ve eaten. My favorite way to grill indoors. Digital thermometers for the win. 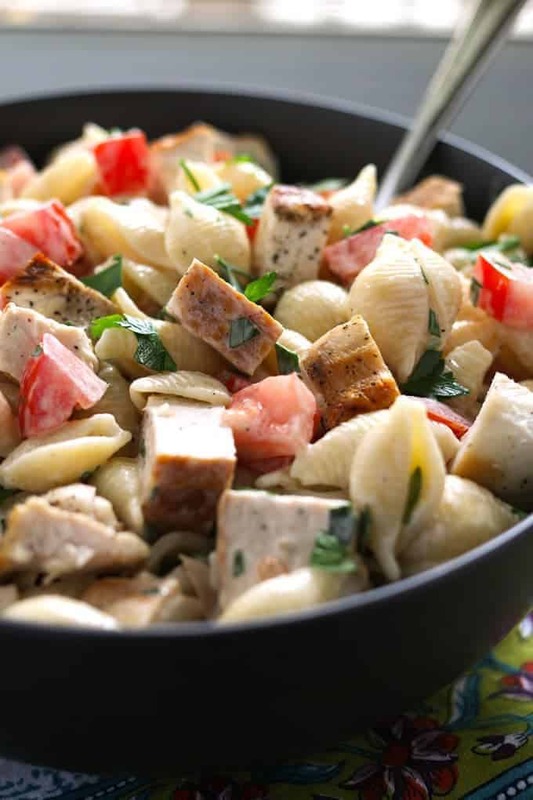 Try this grilled chicken ranch pasta salad. 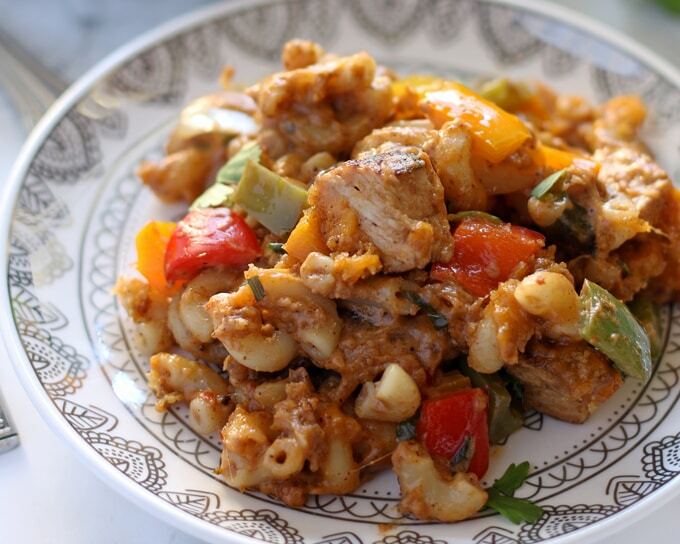 Chicken fajita mac and cheese – love this recipe! This salad looks AMAZING! I can’t wait to try that dressing! I used to have avocados too! I think the first time I had a meal with avocados that I really enjoyed was about 2 years ago. And that was in a cake! Took me a while to eat it on toast or in a salad and now I can not have enough!!! And this salad, pass me a bowl, please!! I always crave salad in the summer too, especially salads like this filled with all kinds of goodness! And that dressing looks amazing! I make this for mu husband often. Such a lovely flavor combination! Yummy! We eat TONS of avocados here at our house! I will be certain to try this great salad with them ASAP! Jenny, this would be perfect served up in a wrap or on lettuce cups too! I love this! This salad sounds amazing! I love avocados and eat them every chance I get! I would pour that dressing on anything and eat it! I ADORE avocados and this looks like an amazing way to enjoy them! Oh my. I really love this recipe! 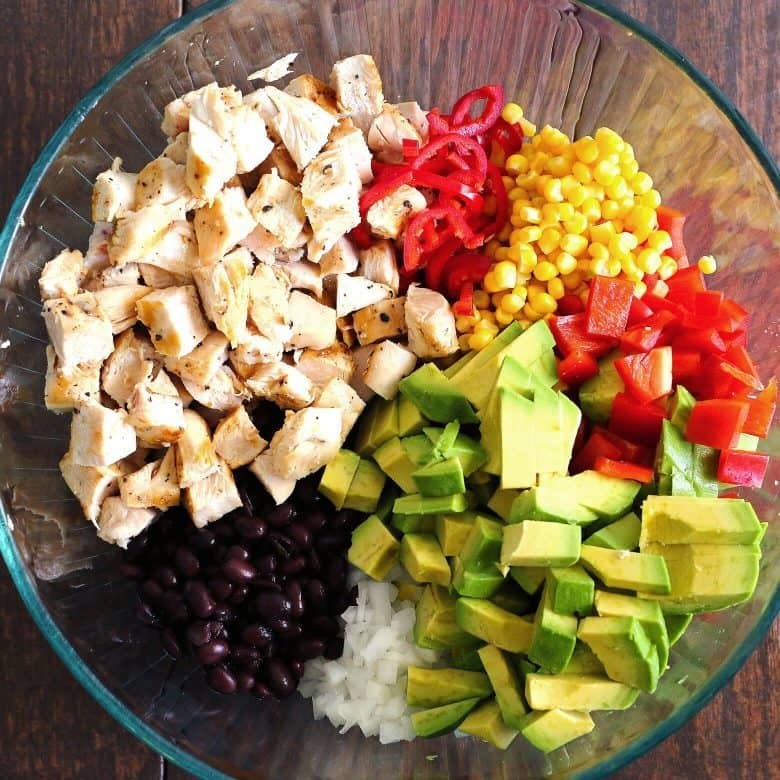 Great flavors, colors and I love everything with avocado! Loving every little bit of this salad, so many amazing ingredients!!! I love a good salad for dinner. Especially when it’s THIS hot outside. This salad looks so delicious and super filling! I’m going to have to mix this up and enjoy for a few meals this coming week! I used to feel the same way about avocados as you! But now I can slice them in half, pit them, sprinkle with salt, and eat right out of the skin! I love smearing them on toast, and mixing them with my deviled eggs. I can’t wait to try this salad! It is right up my alley, on my diet plan, and looks so delicious!! Oh wow – this recipe has my name written all over it! Pinning! I absolutely adore chicken and avocado salad!! This looks absolutely amazing and I am definitively craving for this! & that dressing?? Yes please!! Crazy good! Love all the ingredients! Yum! This salad looks like it contains all of the things I like to eat, especially the avocados! I’d love it if you’d share the recipe at the Healthy Living Link Party that opens at 7pm Central time on Wednesday evening. Thanks! I”m ready to dig in!! Thanks for sharing on the What’s for Dinner link up!! This salad has my name all over it! I’m glad you like avocados now!! This is making my mouth water! I love avocados and it looks like it would be a light lunch for summer! Thanks for joining the Family Joy Link Party! I love this. I’m always looking for quick salads I can make for lunch because I tend to work right through the hour, and this is absolutely perfect. It combines some of my favorite ingredients like cilantro and avocado, not to mention my favorite protein–chicken! Thanks so much for sharing this on #shinebloghop this week. I’m pinning and saving this for later! Looks so good. I love chicken salads. Can’t wait to try yours. Thanks for sharing at the Inspiration Spotlight party. Pinned & Shared. This looks so delicious! I love the addition of the avocados too. Thanks for sharing with us at Share The Wealth Sunday. I hope we see you again tonight! oh my goodness! I am drooling at this scrumptious salad you created. I am printing because it’s on my dinner meal for this week. I so enjoyed looking around your lovely blog and drooling over your meals, LOL I would love for you to share your post at a link party I am hosting. Hope to see you there. Have a great week! Oh my goodness, this salad looks AMAZING! I know my hubby would love it since grilled chicken and avocados are two of his favorite foods! 2 pounds of chicken… 1 serving..? :O Are you trying to kill me??? Or did I miss something here? This sounds delish! I’m on Low Carb so I’ll have to leave out the black beans and corn *sigh* but there will come a time that I can add them again. Would like to know how many servings this is though..
Hi Guinan, I am definitely not trying to cause you any harm. I have moved to a new recipe card in my posts and not all the serving sizes transfered over. This recipe serves 4-6, depending on your serving size. Just made the dressing and it’s amazing! So good. I’m hesitant to add the avocado tho because I don’t plan on eating this at once and I fear the avocado will brown and go bad. Thoughts? Sorry for the delay in response, I have been out of town with spotty internet. You could add the avocado pit to the salad while you store it – that may keep it from browning. I do that with my guacamole all of the time and it does the trick! I made this the other night. Great for a summer dinner on a hot day when you don’t feel like cooking. It seems to keep well, at least 2 days and then the avacado starts to go bad.. even with the added lime juice. This would be great to take to a cookout or potluck and served with crackers but I just ate mine with a spoon! Thanks for the delicious ideas! What a gorgeous salad! Pinned & sharing on Fb & Twitter. Thank you for sharing on Merry Monday! Hope to see ya next week! This recipe looks divine! I love avocado and chicken together, and the dressing sounds amazing. I can’t wait to put this on the menu. Thank you so much for sharing at Mix it up Monday, and I hope to see you next week too! Everything I love in one salad. Thanks for bringing it to Fiesta Friday. 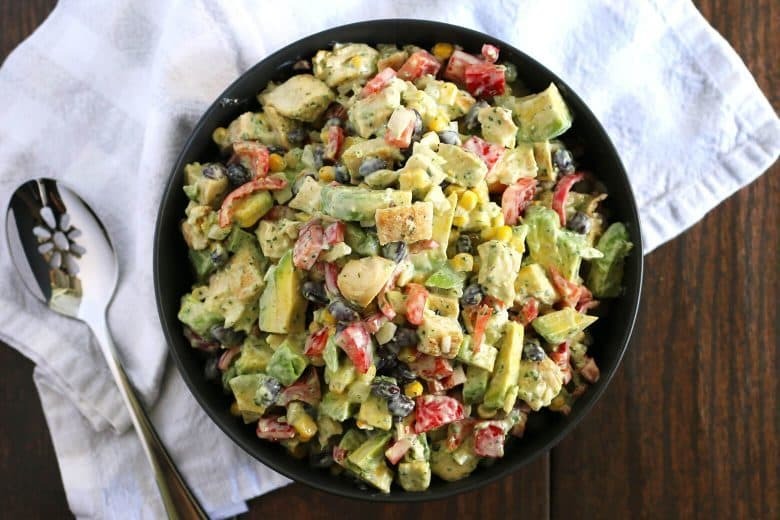 Oh my goodness, this grill chicken avocado salad looks amazing. I love avocados and I love grilled chicken salad so I’m pretty sure that this salad is going to be a keeper. Thank you for sharing on The Pin Junkie link party. Shared and pinned. I also have a fear in adding avocados on my salads or any meal. But I think you inspired me to try. This looks so fantastic! Please make sure that you brought a huge batch with you coz surely this would be a hit at this week’s Fiesta Friday party! Thanks for coming! I love the flavors for your awesome salad! Thanks so much for sharing with Full Plate Thursday and come back to see us real soon! The nutrition fact at the end equal for 1of 4 serving or 1 from 6 serving? Hi Alex, that was for 4 servings – I took a look and changed it to 6 but the nutrition information definitely does not look correct. Even accounting for the high fat content of avocados. I am going to try to manually calculate the information and fix it as soon as possible. I’m the opposite, I think I could put an avocado on everything! 🙂 And on this salad…. perfect! Love the salad and the dressing, it looks creamy and the perfect dressing for this lovely salad – delish! If it wasn’t for the cilantro in the dressing, I’d devour the whole bowl!! Yum! 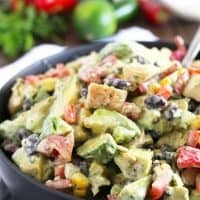 I love avocados and add them to just about everything, but I sure hasn’t had this amazing salad! This is calling my name big time! Bookmarking to add to my meal plan! Wow I’m just drooling! I love everything in this salad and it will soon be on my table! 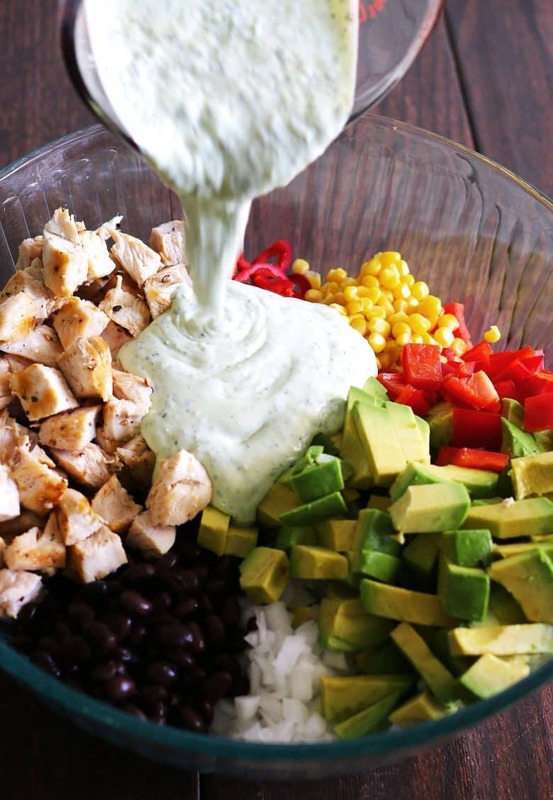 Avocados are one of my favorite foods, so this salad is definitely my kind of salad and that dressing sounds amazing! This is a perfect combination of beauty, health and ease. 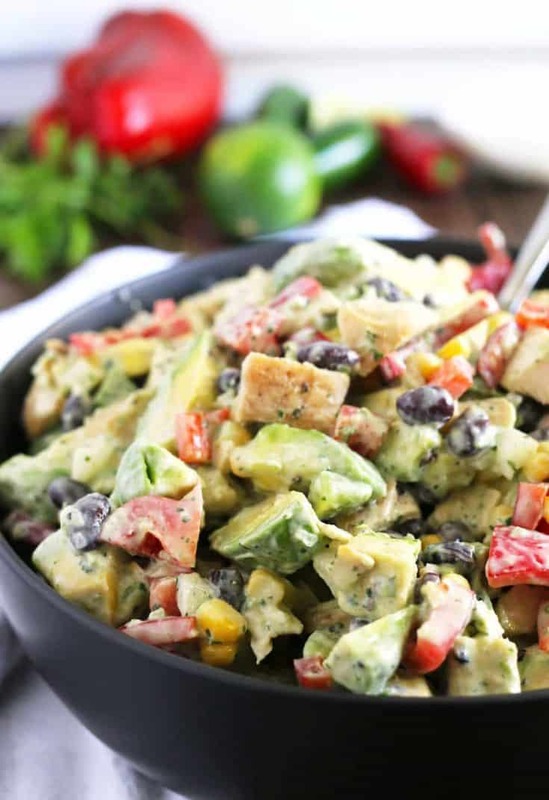 We love anything with avocado in it and I thin you have created another winning recipe here! I made this salad tonight and it was delicious. Looked exactly like the picture posted. Will definitely make again. This salad looks amazing! I can’t wait to try it. Is there a way to make it so it is lower in fat?